Seattle Cherry Blossom and Japan Cultural Festival. Not only did he substantially break the existing record under less than optimal conditions for such an undertaking, the complexity of this effort was dramatically more demanding than the previous record holders effort. This is not in any way to underscore the previous record. Afterall, the previous record before 1998 was 380 cuts. When we examine the scope of an activity of this sort there are many aspects to consider which will be addressed in the text which follows. The formatting for the event is one swordsman, one katana, and cutting goza, without resharpening the sword. The original unverified mark - 380 cuts – test cutter unknown. The 1998 record - 1000 cuts, one hour thirty-six minutes thirty-six seconds: Mitsuhiro Saruta, Osaka Japan. Russell McCartney Founder of Ishi Yama Ryu Battojutsu dojo Seattle, Wa. The whole idea of 1000 cuts came in September 1998, four days after Saruta set the record, when he visited my school in Seattle. When I picked him up from Seatac he didn't appear to be feeling well. Commenting that he was very tired from his record event, so I left him at his hotel to rest. That evening upon visiting our dojo he had to retire shortly after he got there from what was obviously extreme exhaustion. The next evening at dinner on his last day in Seattle, with seven IYR students present, he opened the challenge to me to try and break his record, commenting there no one else in American would or could try. I thought about it for a moment and felt, "why not?” After all the reality of it seemed so far away in the distant future if it would ever really happen at all. Before he left he asked if I would help him with approval of the new record and I was given documents and pictures of witness, and (as I was the one who converted the Super Hi 8 tape to VHS) an original 'un-edited' video of his effort, in order to contact the Guinness Book of World Records for verification purposes. It was my feeling that an extreme effort like this should go into the record books. I had no real intention for the next year and one half to actually consider anything of that sort as I was still heavily involved in muscular and connective tissue therapy from the two rear-end car collisions I received in September of 1996 and January of 1997. For this time being I was unable to do much more than moderate, semi-regular training. Even though I discontinued a former relationship with Ryu Sei Ken, I did continue to assist in Saruta's Guinness approval for several more months till it was accepted. Looking to the future I set my focus on our own schools development. I really wasn't feeling capable to the task at that current point in time as I mentioned and began, for the first time, to consider just some of the implications of what a monumental task like 1000 cuts would mean which only might happen at some point in the distant future. Still, in the far back corners of my mind I hoped to somehow get an opportunity to make the effort at Seattle's Cherry Blossom and Japanese Cultural Festival if I were to do it anywhere. Even this far out the first and primary concern was "what about a sword???" And as for the program itself, there were things we could change and still stay within the Guinness format, yet there were several issues to consider which could not be changed. Some of those issues, like the fact that Saruta used a really great sword, newly made around 1996 were not flexible. Obviously using 'that' sword was out of the question! Smile!! And due to the rules I had to use a Japanese made forged and folded blade. For my effort I chose the only sword I had which was capable of the task. My W.W. II Gendaito from the maker Kanehide was what I always used for bamboo cutting. It was in poor polish, had only weak military mounts and a tsuka which was no longer fit for test cutting. Ironically, it was nearly the identical length of the blade used by Saruta, just one-eighth inch shorter. As the logical (and only financially reasonable choice) I sent it to a polisher we use through our school service company, Stonehouse Supplies. I wanted it polished anyway and decided I would only have the first half foundation of a finish polish done, as this is typically the sharpest edge achievable during the polishing process. So, with the sword at the polisher, I set myself to recovery, receiving Rolfing (a painful myofascial release and deep tissue therapy) every week. For the next year and one-half training continued as before with the regular public appearances and enthusiasm for sword arts we enjoy here in the Northwest sword community. Finally several months later at the Eastside Nihon Matsuri in Bellevue in September of 1999 Akira Takeda the advertising and promotional director for the Japanese consulate here in Seattle, saw our demonstration. In the ensuing conversation my friend Masaye Nakagawa mentioned my future Guinness Senbongiri challenge. Takeda was excited and insinuated it may be a great event for the year 2K Cherry Blossom Festival. I apparently hide my surprise enough at her mention because I hadn't thought about one thousand cuts for a very long time. At this point I hadn't even begun to consider a date for the Senbongiri. Now it seemed I would have to think more seriously about really doing one thousand cuts. For the event approval there was an application process plus a video presentation to the entire committee. As it turned out, most of the board was very excited about doing it and with some others just kind of 'ho-hum, it's just another martial arts event’, attitude. We, the Cherry Blossom committee and I, were all agreed that this effort must be in good taste. Mr. Takeda was very helpful too as he had seen our demonstration already. At the presentation the chairpersons, Mr. and Mrs. Sasaki warmly welcomed me. They were of like minds with us that this event crossed cultural boundaries. Those virtues of commradery, sharing and cooperation are the keystones of why this area has moved to the forefront of sword community innovation certainly in the West Coast area and perhaps throughout the world. It is an honor to work with those from the Japanese community here in Seattle like the Sasakis, Takeda san, and others family names like Sakai and Nakagawa. Many others here also see the value of saving this integral part of Japanese culture no matter who does it so long as it is represented in a traditional respectful format. They see the true value is in the preservation of the artform with the tradition of swordsmanship being carried on regardless the ethnic background of the practitioner. There are other members of the sword community along with us of IYR here in Seattle like; fifth Dan Scott Irey of Muso Jikiden Eishin Ryu, fourth Dan Robbie Pellett of Shinto Ryu, and Yon Dan Hector Caroso the two time all Japan tameshigiri champion of Takeda Ryu, have also thrown off the yoke of separatism by encouraging multiple technique events where all swordsmen can share in this brotherhood of swordsmanship. By the time we received approval from the Cherry Blossom Committee, the April 22 date was six months away! It was really time to get serious about 1,000 plus cuts. Then finally, in December of 1999, I received an e-mail from Guinness confirming that Saruta's record had been approved and with that notice I returned to them my acceptance of his challenge. It was starting to come together and gaining momentum fast. The first and one of the best decisions I made was to enlist the help of my senior teaching assistant, Tim Wilmot. Tim has been training with me for four years and was a big help during the entire process of preparing the strategy for the training sessions and the event itself. As a Nidan who accompanied me to Korea, he knew about the pressures of competition. His selfless loyalty through the steps of this process included being available three days each week for special training sessions. This was a great help over the two and one half months of hour-long training sessions prior to the event. It really helped and meant a lot to me too. We are very process minded here and having him there through this special process meant being able to bounce possibilities off someone who was also well acquainted with target cutting. Also having someone as an observer, he could see aspects hidden to me, which were indigenous to this type of effort. More importantly Tim had an objective view of what I was physically capable of because of the years of training we had shared. This saved alot of time in the planning stages helping me to balance my program. Also Victor Woo another long time student helped to plot out the target use and timing sequences for the effort and how many targets we might need if things went well. 1. I would use similar protocol as the then current record holder for my effort by running the program from a Kata based approach. 2. I wanted to make my effort more challenging than Saruta's achievement. I felt to accept the challenge and possibly break the record was one thing. Yet I wanted to substantially break his record and to achieve that, my approach to the event would have to be a lot more involved than simply doing more cuts. (Link to page www.ishiyamaryu.com explaining other techniques we study-i.e. C.B.S.I., also for email inquiries write info@ishiyamaryu.com) I decided my technique, Ishi Yama Ryu, was the most logical for me to use. As we study four techniques at our school, IYR provided the necessary diversity of technique with appropriate depth of movement and power while maintaining the finesse to be perfect for something this extreme. If combined techniques are too different from each other, a distraction from lack of continuity forms. This was going to be tough enough in and of itself. My next immediate concern was now turning back to the sword, the Kanehide, which I had no handle for! I had gotten it back from the polisher last July but it sat in the safe since that time and time was not on my side in the handle department. Fortunately, I had purchased a saya some time ago while in Japan. Since I felt an American effort was in order and since I had a nice, solid silver moon and gold crane, Fuchi Kashira from Fred Loman so I called Fred again for Same' and was lucky enough to get some very unique gold peony Menuki as well. Though there are many fine American handle wrappers there was really only one person, in my mind, to assemble the handle for an attempt like this. Having had a great wrapping job done by this man about eight years ago I knew his work was first rate. He is a local here and an American, but more importantly in recent years he had become one of the top art Habaki makers in the world. Of course it could be none other than Brian Tschernega. When I called Brian, he was intrigued with the idea and agreed to meet to discuss the project. Through our discussion he hinted the sword wouldn't be it's best aesthetically or functionally with a Habaki from WWII. Needless to say, I seized the opportunity for him to make the new Habaki. Since the Fuchi Kashira had Goto texturing, Brian chose a beautiful go-ishi (moss) finish for the Habaki. It sounded good to me, so we boxed all the parts and blade and Brian was off to his shop. I decided long before calling Brian that money was no object and with the sort of time crunch we were under he could ask just about any price and I would gladly pay it. If you have ever seen Brain's work, you know he is a true master of his craft. The reality was his fee was reasonable and more than worth every penny. When it comes to cutting, there can be nothing of waste between the practitioner’s hands and the sword. The Tsuka must be a true link with no separation technically, physically, or emotionally. He doesn't really like to do handles too often yet I knew Brian's work is for all intent and purpose, perfect. The psychological confidence I gained from having Brian's involvement played significantly into my strategy for the event. Throughout the two weeks of training prior to the event that I was able to use the sword in its finished form, the handle performed consistently, ever molding to my grip. The result is the near leather-like texture of silk Ito one finds on old, finely wrapped handles. No surprise then that some old wrap jobs lasted decades. As April 22 loomed in the distance, all manners of small issues needed to be dealt with in order to quantify their priority. My teaching regime was already pretty full, teaching ten hours per week excluding private lessons. The biggest realization at this point was with just about twelve weeks to go, the training I needed to do was entirely different from regular class time workouts. Oh, sure, the regular Thursday night repetitive swing work helps, yet the reality of the huge difference between 600 swings with a heavy Bokto and even 200 precise Katana swings with solid technique was another matter altogether. Simply the notion that I did not want to miss even one cut was an issue that took some time to work through. * Step into a pitching machine batting box and hit 50 solid home runs. * At a golf driving range, hit just fifty 250 yard drives right down the middle of the fairway without knocking the tee over. * For swordsmen, run ten kata 50 times and have solid tachikaze with each swing. (Read on for post Senbongiri student 50 cut test results.) If you are able to make it that far, double it within one hour and you will begin to get an idea of what Senbongiri tameshigiri is like. In order to eclipse the old record the components of Ishi Yama Ryu technique and strategy had to blend just right and as such they should also compliment each other. There were many other important issues to consider as well. As for the rest of the technical variations, I included our intermediate swing, which is similar to the Shin Kage style swing, the full continuous swing, as well as the unique 'cut block cut' of Ishi Yama Ryu advanced technique. I also planned to cut kesa and kiriage with both right and left hand technique. As part of IYR training I have incorporated one hand kesa and kiriage training which has aided in the fifteen year development of the IYR Ni TO Ten Ryu two-sword technique. Gengler, a past two time Olympic silver medallist in crew rowing had been an important advisor. It was her suggestion that pace work in the final weeks before the event would help me to deal with the pressure adrenaline exerts on a demanding effort like Olympic competition. The reason is when the mind goes away the body’s kinetic memory sets its own pace based on that previous pace work. If I got far into it I believed I would settle into a rhythm which could be sustained for a few hundred more cuts. At that point fatigue would set in until there were a hundred or so left and then adrenaline would help take me through the remaining cuts for the record. That was the practice theory anyway. Through the period prior to preparation of the targets there was considerable discussion concerning how the targets should be rolled. Typically we roll targets with about six inches of the first edge folded over. Then the goza is rolled firmly toward the remaining edge where this last six inches of the other edge are then folded back to the rolled portion thus leaving a clean folded edge. The entire bundle is then fixed with four lite duty rubber bands. We decided to roll these targets as hard as possible for this event. (This decision was to torment me throughout the entire event, as you will read later.) The targets are then placed in soaker containers vertically and turned on end every six to eight hours over the next two days. They are then drained in a cool shaded area for the next few hours. Contrary to what many believe, it is more over the temperature of the water and surrounding air, which varies the density of target material. (see www.naba.ws) tournament regulation stands according to height and weight. Victor Woo was in charge of the target rolling crews and their respective teams. They also provided targets of 'igusa' goza imported from Japan. Targets the consistency of top quality ‘igusa’ goza provides a reliable density, which only comes from this product and source. A major concern soon came to be centered on the spiking group. The yudansha at honbu was the obvious choice for the spikers because most of them were familiar with test cutting and target setting. This yudansha group together (about fifteen) with the other members of the IYR extension schools totaled nearly seventy students, not including the Seattle Center or Cherry Blossom personnel. Of course there was the need for the soaking containers for the targets. Once again Stonehouse came through to provide fourteen ninety-gallon containers for the five hundred targets the IYR students had prepared over the previous two weeks. These targets were soaked for two days and one night and teams of target tenders came to the dojo in shifts every six hours through the night to turn the targets. 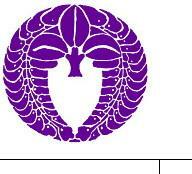 We always have patterned the preparation of our targets to that of Japan seminar and tournament situations. From our experience with Toyama, Yagyu, Seki Guchi, and Ryu Sei Ken, these events consistently showed us one to two day soaking times with this material. Four rubber bands are equally spaced throughout the middle and about six inches from each end of the target. They are then soaked, pulled, drained, and are ready to be cut. This is generally the most widely accepted format used throughout Japan. Our targets were similarly prepped and soaked in cool water then turned every six hours. All manors of soak times are used depending on the accessibility and environment of each particular school. For the previous record it appeared the targets were not rolled tightly or that they had been soaked for a very long time. I only know this from the visual evidence of the way the Japanese target tenders walked onto their field area with a target in each hand and casually dropped the targets on to the spikes of the stands. Our targets were rolled very tight, tighter than we had ever rolled them before. The logic here was they would stay on the stands. If I was going to fail at this I wanted it to be because of my mistake, not for improper target setting. In the end however this logic tormented me through the entire effort. Because the targets were rolled too tight they could not soak up enough water and as a result were extremely tough to cut. To offer some idea for those of you who aren't familiar with target consistency, there were around one hundred targets left after the event that the students cut over the next three weeks. After that three weeks in water those targets were still VERY "VERY" hard and tough to cut. During the event most of the targets would only go half way down the spike where the spikers would then lift the entire target and stand to slam it down onto the hard floor of the cutting field with a resounding clap like a rifle report. This additional noise eventually blended all the other distractions in a venue like the festivities of the Cherry Blossom festival. Part of my preparation was a ritual misogi purification ceremony. This has been a valuable training aspect here at IYR, which helps to center the mind and body and regulate breathing at times of stress. Kannagara Jinja, is a beautiful Shinto shrine north of Seattle under the purposeful guidance of Kannushi Koichi Barrish, the first fully ordained Shinto priest outside Japan, (also a Caucasian American). The entire black belt group of IYR and I participated in a misogi ceremony for the coming year two weeks prior to the event. Then the day prior to senbongiri Kannushi again did a special ceremony for installing the Budo Kami of success and safety. Regardless of ones religious or spiritual beliefs, experiencing the power of one of these traditional ceremonies brings one to a place of special clarity. Reverend Barrish has been a steadfast supporter of IYR for many years and a genuine supporter of this Senbongiri event. As a special favor he also loaned me a magnificent raku bowl and ladle for the swords own water purification with water from Kannagara shrine for the opening ceremony the following day. The IYR students had arrived at honbu dojo at 10:00a.m. to drain and reload the targets before moving them with a ton and a half truck and trailer the four miles to the Seattle Center House main stage area for the day’s event. There were about 1500 people present at the Seattle Center for the Cherry Blossom Festival alone. The students arrived at the 'Center' at 11:45a.m. and were busily in the midst of setting up for the event. Those assembled to judge the event were four martial artists, Walter Von Krenner 8th Dan Aikido, Scott Irey 5th Dan Muso Jikiden Eishin Ryu, Clinton Rassmusen 2nd Dan Battodo, and Vernon Owens 5th Dan Sabaki instructor, and the two independent Guinness judges Joe Bryant a local Seattle radio personality, and Sean Young an International trade specialist. When I arrived the place was absolutely buzzing with a festival atmosphere for the wonderful program of events honoring Japanese culture. Now for the first time I saw the cutting field with its twenty target stands and looked over the field for last minute adjustments of the stands. The floor surface of the cutting field was a beautiful Frank LLoyd Wright design parquet floor. Its composition was one-quarter inch ends of two by four boards laid on a cement foundation, in epoxy. It then was coated with "clear varathane" which made it look about one foot thick. The floor was beautiful to look at and perfect for the ballroom dancing and thousands of visitors the Seattle Center gets in any given week but less than ideal for the use it was about to see. The field was arranged in a large oval with straight sides similar to how the then current record holder had done. The only difference was I had two stands one quarter in from each side at each end of the field and with straight sides and an area at the judge’s end set for four-direction cutting. The site of twenty stands fully set with targets struck an imposing image. I figured the exercise would develop in roughly three segments. If I made a mistake in the first three hundred or so cuts I could theoretically begin again. If all went well I would probably settle into a rhythm which would last for several hundred more cuts. If I made it that far adrenaline would hopefully kick in and help carry me through to the finish. With all the preparations completed the moment was at hand after a lot of time and thought which began two years ago. I retired to dress and prepare myself for the most difficult episode of my life as a martial artist. With barely ten minutes to go fully warmed up; it occurred to me to get the larger butterflies out of my system and asked for two of the greenest hardest targets Tim could find. He came back with two pieces, one nearly fluorescent green and the other more brown in color. When I spiked them on the stand it seemed they were quite firm yet I was surprised when I cut them. They were like cutting through rock pillars! When I spiked them on the stand it seemed quite firm and I was surprised when I cut them. I had experienced something like this before when I cut new goza but this was really something else altogether. At this point I thought about the razor edge Brian had put on the Kanehide. Yet there was no holding back now. All the preparation came down to this moment. I knew this was going to be alot harder than I had previously thought and wondered how long the edge would hold. Fully warmed up I moved out to the front stage area to greet the crowd who had assembled, ready as I would ever be to begin senbongiri. The previous week prior to the event I had seen both Sara, and my massage therapist who, at my request, worked on my arms hands and shoulders. This, in hindsight, was not to my advantage. I moved from the stage to the cutting field floor, tied my tasuki (yes I was a little nervous) bowed to my wife the spectators and judges, walked to the far middle of the field and began Senbongiri. Before I began to cut, the initial issues centered on the noise from the crowd, the flashing neon lights, and the hard slick floor were all dazzling. Immediately after I began I realized I was gripping the tsuka much tighter than I usually do. This made my hands perspire at a tremendous rate. Of course this was a seemingly endless circle. If I hold the sword too loose I run the risk of loosing my grip, tighter and the tsuka continues to get more wet and I might loose my grip. I had never experienced this before and I was pretty much helpless to change the situation. The reason for this occurrence was the extra degree of relaxation from the therapy to my forearms the week prior to the event. What I didn't realize before was that through regular training the forearms and hands carry a natural level of tension, which in effect helps to hold the sword. The body tends to lean into the tension and a natural equilibrium is struck which balances tension with relaxation. As the effort progressed this reality came to me and as I entered the four hundred cut zone the forearm tension increased and my hands stopped perspiring. Though I never felt like I would loose control of the sword, it did make for some astounding clarity in the area of tenouchi. In the days following the event the muscles in my hands were sore from the thumb, across the palm side of the web of my hand to the center of my palm and back to the index finger knuckle joint where the finger meets the hand. Through the practice sessions the heal of my left palm was so hot from all the cutting movements that for the first time in eighteen years I felt I might get a blister in that area. During continuous activity like this, muscle memory must take over. It felt good to know we were teaching these details to our students. From around four hundred cuts on my hands and grip worked perfectly and the left hand heel never got hot. As I said before the crowd, lights and sheer exhilaration of the event in the beginning, put great demands on my ability to stay focused. When the opening ceremony was finished, I had dressed myself with the sword approached the starting point and began. From that point to around several hundred cuts, I didn’t really have any thoughts. It was all feelings, which were flooding into my senses. It was very much like the river near my home. Calm with an under current, moving more quickly into the pre-rapids where everything moves quickly with only enough sensation to maintain control. From then on, around two hundred cuts or so, the river became a stream of information, which was fairly predictable. As I settled into my rhythm, I was able to recall the program of technique I would use throughout the time remaining. In retrospect I have termed the whole thing as ‘Senbongiri Technique’. This is as close as I can describe the temper of this endeavor. Activity far from kata, simple test cutting, and much more close to what true battle must have been like. The targets themselves were the enemy of sorts. At IYR we visualize target cutting as the death of our negative self, those things which keep us from performing at our optimum. Each target an increasingly difficult challenge. With each swing the sword was loosing its edge little by little and my endurance was finite too. I was feeling fairly comfortable from around three hundred to six hundred or so cuts. This was the area of time that I felt the best and feel the flow of my technique was all I had hoped for. There was a feeling of confidence that I could do any part of my program I wanted. It was here I began expanding the extent of my program with one-hand kiriage and kesa combinations as well as the IYR cut turn cut series, which come directly from kata. I remember thinking and laughing to myself; “did samurai have this much trouble with their jubon (undershirt of the kimono) tasuki and kimono?” NO!!! They didn’t cut this many times with them on! As surely as six hundred cuts went by the feeling of any kind of ease left even more abruptly. I was getting tired and looking for that second wind. During the segment after the five hundred cut marks, I wrenched my knee from the lack of footing on the slick floor. This was the first real sign that I was beginning to fatigue. I had brought some braces for my knees and elbows in case something were to happen like this and I was thankful I had. I took a few seconds longer for the next couple of breaks and I think the discomfort eased some. I wasn’t fully aware of it because my lower back was really beginning to feel the punishment of the hard floor as I neared the seven hundred cut mark. Some stretching helped but for the most part from seven hundred plus cuts on, I was really taking the hurt of Senbongiri. This was the hardest part as I look back on that time. Each movement, swing, stop of the sword, and draw was, and I will try to be clear here, ‘agony’ pure and simple. I look back to that time now as the most important learning experience for me. Feeling totally pain filled and still engrossed in the heat of the activity. It was and is a time of great clarity on many levels even now. As swordsmen we must always train with the idea that even a fraction of a moments in attention can spell disaster. Yet this is the incredible nearly hidden gift from this beautiful art form. This sense of attention stays with us beyond the training floor and if earnestly sought, brings great peace and comfort to our lives. Even in the midst of this discomfort there was an essence of calm and peace in and through the activity. Tending all the details of good technique are out of conscious thought and are consumed in the processes of the body. There is nothing except the cut. Then the next cut. This was the test and a time of realizing swordsmanship to the exclusion of all else. I was beat up hurting and in the home stretch. The event was on the clock as well as the cut counter but nothing else was of any importance. Only my breathing and the unconscious concentration to the details of successful cutting were manifest in my process. The targets were particularly tough and seemed almost dry. For this reason I had been hesitant to cut more yokos. One target off the stand and it was all over. Yet I had a minimum number of difficulty factors which needed to be addressed if I was to achieve my personal goal. There was one point around nine hundred and fifty or so. When I cut two yokos in a row. The stand and target on the second of the two tipped dangerously close to falling over. This far into the effort and all would be lost. Fate had its way though and the stand righted itself so I put an extra kesa on the remaining piece for good measure. Tim mentioned at the end of the previous round that he wanted me to stop at the other end. I was in the zone and a change like this got my attention. He was good natured considering the look I must have given him but he said the students had a surprise for me. Needless to say, I didn’t want any surprises at this point. When he explained what it was I agreed and set out to the record breaking round. I had already broken the record when I was called to stop for the ceremony. The IYR students came up with the idea of a sword blade style center post target stand with our wisteria mon for the base plate. It was beautifully constructed with a mahogany stain and one lone target on the spike. I approached the target, and gave a reverent bow. This bow of thanks was for so many things. It was for every moment of my life to that point, to all those who helped and those who through their discouragement made me stronger. I drew my sword and with a gaeshi cut (kesa-kiriage in rapid succession) I became the new target test-cutting champion at 1005 cuts in one hour and ten minutes. This had eclipsed the previous record by five cuts and a full twenty-six minutes and thirty-six seconds. It was the culmination, which began over two years ago, even though the whole event was organized and presented in the previous six months. I was feeling pretty good considering what I had been through. Adrenaline had taken hold again and I wanted to see how far I could still go. After all as I stated earlier in this text, I wanted to not just break the record but break it substantially. Tim announced I would set toward another hundred cuts and I was back at it. The mood was decidedly lighter than before yet make no mistake, I was there to stretch it out now. In some ways I felt a huge load had been lifted and my mind clear I was again to task. Swordsmanship of Ishi Yama Ryu should be crisp concise and free of wasted movement. It should be flexible and able to address changing direction and a multitude of various cuts. At one hour and twenty-two minutes and eleven hundred and sixty-two cuts, the technique was still providing me with what I needed to get the job done. At the eleven hundred and eighty second cut, a cut I had used successfully throughout the event, the swallow tail cut, a kesa on one target and an immediate kiriage on the target next to it, pulled it off the stand. It seemed to me it came off easily. Upon replay of the tape, it was clear the target had not been spiked well and the target itself was frayed at the bottom, yet it was not really disappointing. I had been hurting from the beating my back, legs, and feet had been taking from the floor. My arms and upper back were another issue, which wasn’t to be fully realized for a couple more days. On Sunday, the day after, it felt as though there was sand in and around all my joints, muscles and tendons of my entire body, especially my torso. Luckily enough this didn’t last for more than around fifty or so hours when that worn down muscle tissue began to be flushed out of my system from the gallons of water I drank and the limited light stretching I did. I could relate to Tesshu’s student in his post ‘seigan’ condition. In the aftermath of any extreme athletic endeavor, post event recovery time brings many questions. Fortunately I had the time to recover my senses and slowly rebuild my energy level. It was a long time till was back in the dojo at my regular schedule. After all, I had pushed the record up one hundred eighty one cuts and eleven minutes and thirty-six seconds under the previous record. I was OK with that. Though it took a lot, the experience, the lessons learned and the answers achieved were worth it. For eighty-five minutes I had pushed the envelope of my mental and physical abilities further than anything I had ever done before. The nearest most difficult event I could relate this to was climbing Mt. Rainier (14,410 feet in 24 hours) but I am nearly seven years older now than my mountain climbing days (and a lot wiser). Senbongiri was a lot - I say again - a lot more difficult! With ‘the mountain’ you can nearly check out and trudge away till the next rest point. With Senbongiri there were increasingly greater demands on my ability focus as the event went on. And with Mt. Rainier I was over it in a short three weeks. It was to be eight long weeks of recuperation before I physically felt like going back to the dojo. Mentally I craved to return yet I knew my focus and body weren’t there yet. The muscle memory also craved activity yet I knew, for now, it was time for another type of training. It was time to assimilate and absorb the psychology what had occurred. At this date looking back I found Senbongiri to be the most rewarding and gratifying experience of my entire sword career. It will be some time yet till all the knowledge of the experience are fully realized. I encourage others to try if you have appropriate instruction and the technical background to test cut safely. After Senbongiri I was compelled to share something of the experience with my students. The senior yudansha were busily test cutting the remaining targets left over from the event and were cutting way above their pre-event level. It was gratifying to see them cutting so well. Sword training should foster humility, and ultimately rid one of self deception and I believe it does that on a deeper level through regular diligent training. To that end I called up a Gojuppone giri, a fifty cut test. This was to be an example of just what enters the picture when we enter a consecutive test cutting experience. All the Honbu Dojo blackbelts ranging from Shodan to Sandan made the attempt. The format was one cut per target, ten targets, five rounds set on an oval field. Forty percent of them only made six consecutive cuts or less when their minds questioned their process or their technique failed due to mai issues. All other students got in the teens and just one got to twenty-two cuts. Since they didn’t get as far as I hoped they would a second attempt was set yet the results were pretty much the same. Even with multiple cuts on each target before moving on to the next. In this scenario only one student made the full round and cut thirty cuts before a failed attempt. Focus, mai, and basics foiled them in every case. Founder – Ishi Yama Ryu Battojutsu Dojo, Seattle Wa.